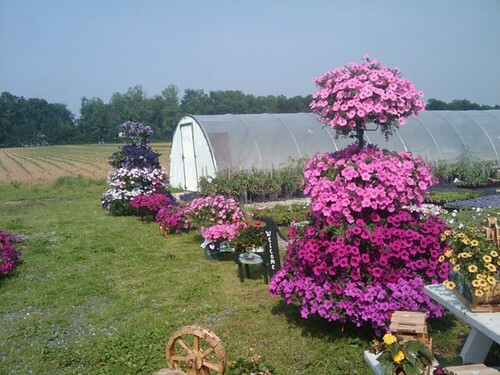 Hidden Acres Amish Nursery, originally uploaded by DianthusMoon. Today I did get out to the doctor’s office to sign the release papers to the new doctor(s). Since I drove all the way out there, I decided to take a drive around to look for nurseries. It was about 90 degrees out-was I crazy to go driving around? I was ‘into’ adding to foursquare, the phone app that says where you are going. I checked into 5 places, but not the little nursery pictured here-too remote. I left the hospital and headed to Oxford, past Lincoln University and Tastykake Bakery. I decided to stop at Dollar General and Rita’s Water Ice (had Mango and Peach Gelato). I went by one small perennial place but it was a bit on the small side. I decided to stop at a thrift shop and bought a few little things. Will show the sweet mermaid decoration from I think I the 50s or 60s. I asked the young man in there about nurseries and he said there was an Amish one down the hill and to look for a sign. 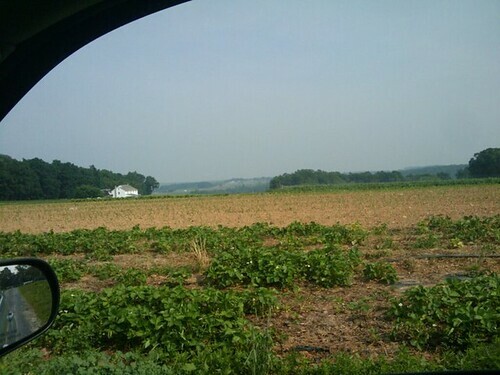 I drove by the road and had to go through a auto shop, down a road and then up a gravel road and found ‘Hidden Acres’. There was no one around and I was looking around for about 10 minutes. I could have helped myself (ha ha), but just got in the car to leave and the Amish lady came around the corner and she said she was at the house. I think most of what I bought was between $1-$3. : ) She helped me to the car and I had a big bag of plastic trays and pots in the back I was taking to Lowes (they recycle) and she took them. Glad to help. My last stop was for white pizza for Sean and me as Brian was going to his dad’s house for a visit. After dinner I planted a few more pots of things. The air was so thick I could almost slice it. I’m thinking of going to Longwood Gardens tomorrow before noon as the exterminator is suppose to come between 2-4. Right now we have a thunderstorm watch-not a surprised!